Looking to start the year with a bang, the Jordan Brand announced the release of one of their best selling hybrid shoes last year, and it will come out this weekend with arguably it best colourways since its first release. The Black/Fresh Water-Midnight Fog Jordan CMFT Max Air 12 is set to hit the shelves this weekend, January 15, and it is expected to be another favorite among the Jordan shoes that will be released this month. Like the previous editions released last year, the shoe still resembles the feature, texture, and durability of the Air Jordan XII, but has a much-improved design and color combination. Its relaxing color combination would absolutely entice the buyers this month. Watch out for its release this Saturday and you should grab one immediately! 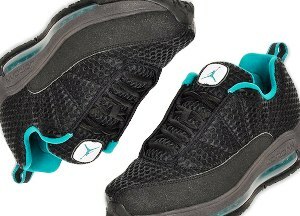 Jordan CMFT Max Air 12 Now Out! i like this air max shoes, nice , how can i order it? Check out Finish Line or Footaction!